In addition to their well-known "QuickPort" docking stations, which provide computer connection to unobstructed SATA hard drives, the Sharkoon "QuickDeck" has long been a table adapter in their product line in which data mediums are not standing upright, but rather inserted laying down. The Sharkoon QuickDeck is also immediately available in a "Pro" edition, with a USB3.0 port and stacking feet. The Sharkoon QuickDeck offers room for SATA hard drives in both 2.5 and 3.5 in formats. 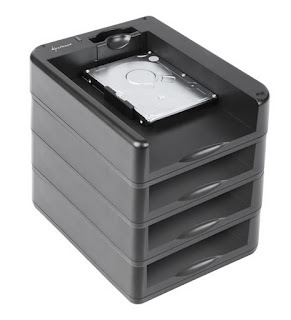 The drives are simply inserted horizontally into the front and open top plastic frame. A rail fixed to the floor folds up for smaller 2.5 inch hard drives. The hard drive can be easily detached from the QuickDeck with the help of an ejection lever attached with the SATA port. External connection occurs over the fast USB3.0 port. Small, round rubber feet on the bottom gives the QuickDeck Pro a non-slip grip. The topside is provided with matching grooves so that several QuickDecks can be stacked to save space and provide simultaneous hard drive connection. The QuickDeck is equipped with a separate power switch and blue operating LED, supports the operating systems Windows XP, Vista and Windows 7 (32 bit and 64 bit), measures 180 x 143 x 40 mm (L x W x H) and weighs 240 grams. In shipping you will find an instruction manual, power supply and USB3.0 cable. End customers will find the Sharkoon SATA QuickDeck Pro available for the suggest retail price of 27.99 euros in authorized retailers. For other information please go to www.sharkoon.com.